Imagine stepping into the classroom and your tablet device knows which lesson you’re taking and shows the name and picture of all the pupils in that class. The SIMS Teacher app makes everyday classroom tasks simple for teachers. With access to student information and updates on key areas of attendance registration, school meal options, conduct and assessment, the SIMS Teacher app helps to support safeguarding and improved teaching and learning by ensuring you have the latest data for your school in real-time. The SIMS Teacher app helps to ensure that you and your staff have accurate real-time data on every pupil in your school. Its intelligent design and ease-of-use means teachers can complete essential tasks efficiently without any delays or frustrating database updates. Teaching shouldn’t be about endless administration tasks. The SIMS Teacher app makes everyday classroom tasks simple, so that taking registration, looking up a students’ information, or recording conduct or assessment data doesn’t take attention away from your class or your teaching. 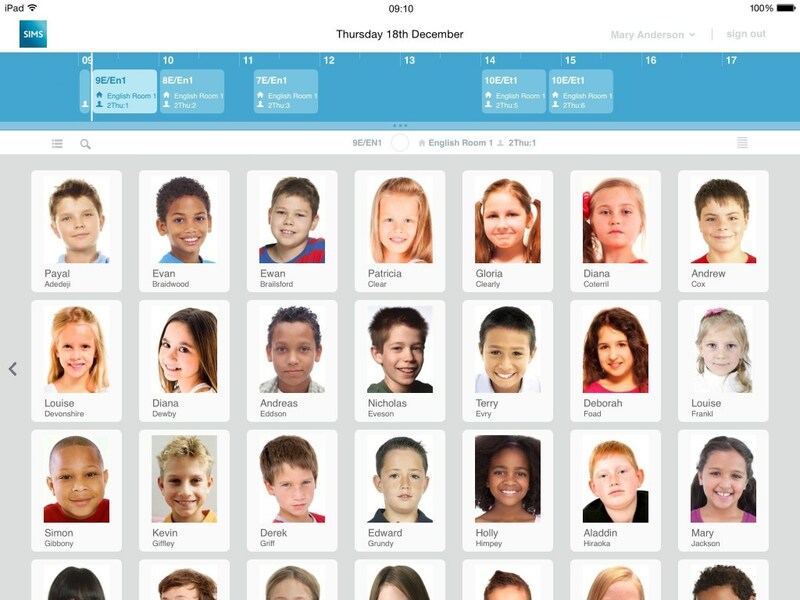 The SIMS Teacher app makes it effortless for teachers to record attendance data for every pupil. Quickly record present, absent, and late marks or school defined codes with a few simple taps so that you can get back to your lesson. If you need to mark a pupil late, the app automatically indicates the current number of minutes past the class start time. Contact information and conduct can be viewed with each pupil profile, along with relevant medical and dietary information. A teacher can see at a glance if the pupil has been awarded behaviour or achievement points in a previous class that day and over the last 2 weeks. By tapping a pupil’s picture a teacher will be able to award achievement or behaviour points. The app records the correct number of points for each type. Teachers will be able to quickly and easily access assessment marksheets and then enter grades, comments and marks. Record formative and summative assessment judgements for the Programme of Study with ease. This simple process will enable teachers to effortlessly record achievement as it is observed. On-screen analysis provides instant feedback on achievement and raising awareness. The SIMS Teacher app allows teachers to check their timetable wherever they are for today, this week or the whole academic year. You can also view the timetable for a pupil to see which lesson they should be in, view other teachers’ timetables, and even take registration for another class. Not only will this help to free up your teachers’ time to focus on what’s important in class, but it will ensure that children’s dietary needs are being satisfied and that the school canteen has all the pupil information it needs to hand in an instant. All the data used by the SIMS Teacher app is encrypted and the app uses industry standard security measures so all confidential information about pupils is secure. The SIMS Teacher app is an annual subscription based service, with unlimited users based on a charge of £2.00 per pupil, per year. A 10% discount is available for schools taking a 3 year subscription. All of these services are offered FULLY INCLUSIVE within our MIS Core SLA and incur NO additional charges to schools. Click below to visit the Teacher App website where you can read case studies and take a video tour, or alternatively contact the MIS Team on 0191 4338525 if you would like further information, a demonstration or guidance on implementing SIMS Teacher App.